Insignia on M has it all. From a convenient and vibrant location to all of the features and amenities you could ever dream of. Here’s what you need to know about this Navy Yard oasis. Insignia on M is located right above the Navy Yard metro station, making your commute simple and easy. With a walk score of 89, the area is incredibly walkable so you can get anywhere on foot or by metro. You can do your grocery shopping at the nearby Harris Teeter and CVS. Grab a bite to eat with friends at Nando’s or Gordon Biersch. Take a brisk morning walk at Canal Park or Nationals Park. Everything you need and want is right around the corner at Insignia on M.
Spend warm summer days relaxing at the resort-style pool with an umbrella drink in hand. Kick back with friends in the clubroom where you can challenge them to a game of pool. At Insignia on M, we love pets! That’s why we offer a rooftop dog walk, pet spa and wash station. Fido will feel as pampered as you here. You can pump some iron or practice your downward dog in the fitness center, which is complete with a yoga space. Head to our digital cafe for your morning Starbucks fix each day. Play hostess in the penthouse level residents’ club where you can throw or attend events with a stunning view of the Washington, D.C.. Choose from studios, one bedroom and two bedroom floor plans at Insignia on M. Whatever suits your needs, we’ve got you covered. Check out our floor plan designs here. Ready to call Insignia on M home? 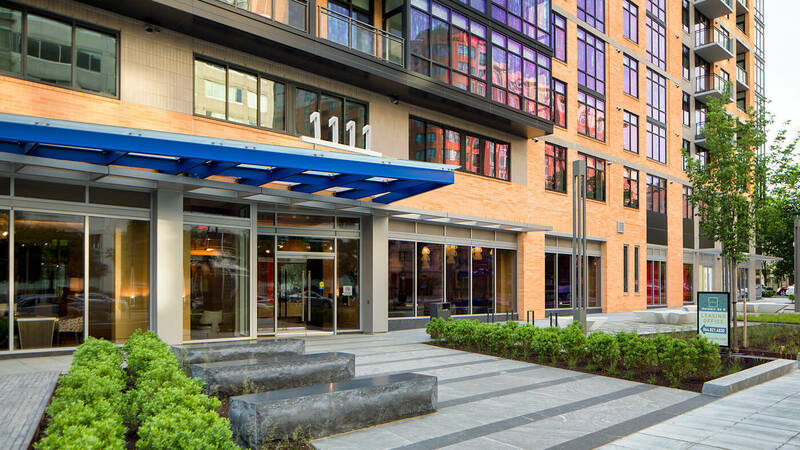 Contact us today for more information on life in the Navy Yard or to schedule a tour.